“Enjoy the rest of your evening,” said the Drama Teacher of my daughter’s secondary school, after having chatted with her at our first parents’ evening there. “But that’s dancing, not drama!” piped up the eleven-year old, only slightly embarrassed. Her first ever ballet, she wasn’t sure what to expect. Experience with Baz Luhrmann’s 1996 film, Andrew Matthews and Tony Ross’ The Shakespeare Collection (of books for children) and Shakespeare at The Tobacco Factory’s stunning 2015 performance of the writer’s best known tragedy had versed her well on the story so I, in hindsight mistakenly, didn’t feel the need for us to recap. But a telling of even this classic and universal love story can be tricky to digest without (the usual) narrative. Even when this beautiful. Sergei Prokofiev wrote this masterpiece in the interwar years and it surprised both of us that we were familiar with parts of the music, notably ‘Dance of the Knights’, and early on in the ballet we drew comparisons between slices of this score and the same composer’s Peter and the Wolf. “I know this!” she gasped, eyes wide. The music is sweet, bold, light, heady, dignified, foreboding and ENB Philharmonic’s offering is played stylishly to the letter under the firm direction of Gavin Sutherland. 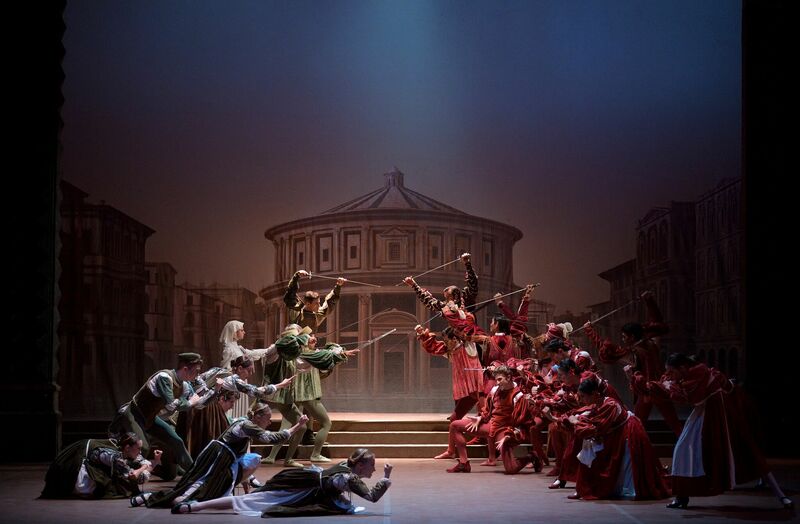 The large cast of 60 necessitates clever use of the stage by designer Ezio Frigerio and the set is pushed way back for many of the scenes, allowing the dancers to take command of it, Juliet’s all-important bed often the only real furniture, being, after all, where key elements of the love story happens. But amongst the highlights for me are the crowd scenes: at the Capulet’s Ball, where our star-crossed lovers first meet, 40 dancers are resplendent in lavish, twinkling costume as they glide, turn and jump with barely a sound in a breathtaking upper-class party of gorgeousness. It is here that we see Jurgita Dronina’s playful Juliet blossom into a woman in love and Aaron Robinson’s carefree Romeo suddenly becoming aware his own infatuated soul. The energy required by both Dronina and Robinson is massive and each one rises admirably to the occasion (they complete 60 jumps in the balcony scene alone!) We’re so close to the stage that we can see the flex of Robinson’s muscles. We’re with Juliet through every innocent, delighted, torn, distraught expression. 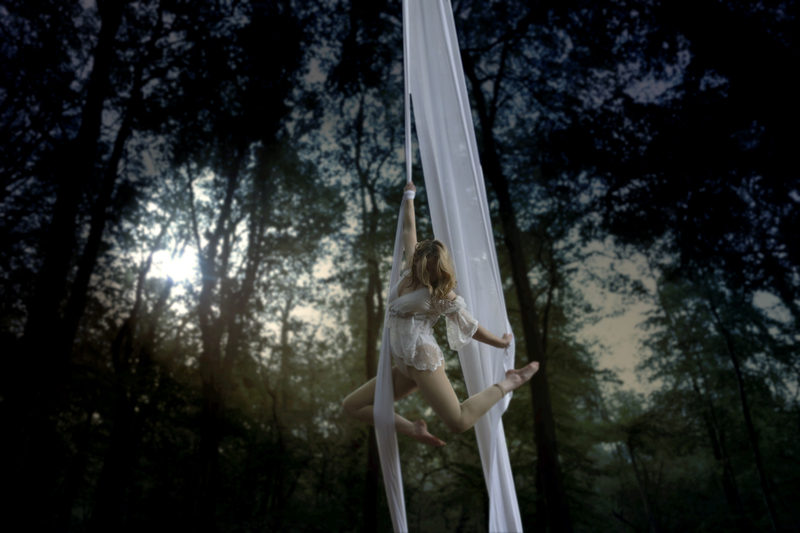 This really is drama, so much more than simply dancing. And that drama is at its height during the many fight scenes. 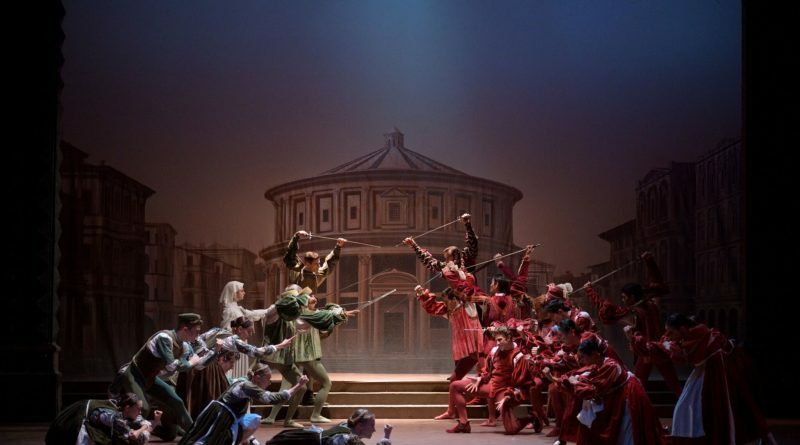 The opposing Capulet and Montague factions clash constantly, as both women and men tussle with each other, throwing their enemies around, jeering, gambolling with an element of slapstick, circus-like. It’s easy to see why ENB have stayed faithful to Rudolph Nureyev’s 1977 choreography, winner of the Olivier Award for Outstanding Achievement in Ballet that year. And there are sword fights. Tybalt versus Mercutio, Romeo versus Tybalt, Paris versus Romeo. Until you’re holding breath. How can they move so elegantly whilst wielding swords (and a knife)? Are these dancers actually fencers too? Pedro Lapetra deserves a mention in his role of friend-to-all Mercutio because he plays this part with such jocularity that you imagine you hear the rest of the cast speak, “But what buffoonery? Fear not, ‘tis the loveable Mercutio.” His death is avoidable and we feel sorry for it to the point that we, just like the cast, refuse to believe it – just one in a series of promising lives doomed to untimely extinction. And so to the mortal demise of our protagonists. Given the length of the ballet (three acts over three hours, including two intervals), the final scene in the Capulet crypt is woefully short, though this surely alludes to the opinion that the taking of one’s own life happens in but a moment and it is the exuberant life that surrounds it where the real beauty and drama takes place. Romeo and Juliet is about that rich tapestry of human emotion, expressed here by a winning formula of Prokofiev, Nureyev and English National Ballet. This proved a tad long for my daughter on a school night and she found it difficult to interpret the Dance into story in places, the taking of poison by Juliet the part that stood out most for her, Dronina’s wonderful portrayal of a young woman grappling with terrible indecision making it so. I loved this production and would urge you to go if you get the chance. it really is a delight.